Andrew Bell of Anden Ltd. became one of the furthest travelled speakers to address a Scottish Branch meeting as he had travelled from Portleven in Cornwall. He gave a very interesting talk, well illustrated by slides. Between 1977 and 1999, Mr. Bell headed the company that provided the shipping service to St. Helena. With a population of some 8,500, St. Helena is situated in the South Atlantic some 1,200 miles (1,950 km) west of Africa. The island has an area of 47 square miles (122 square km), and is approximately 10.5 miles (17 km) long and 6.5 miles (10 km) wide. The capital and port is Jamestown. The island of Ascension and the island group of Tristan da Cunha are dependencies of St. Helena. St. Helena is a British Dependent Territory and has a governor who is also president of the Legislative Council. St. Helena was discovered on 21 May 1502 by the Portuguese. The island became a port of call for ships sailing between Europe and the East Indies and in 1633 the Dutch formally annexed the island, although they never occupied it. In 1659 the East India Company took possession of the island as this gave the company control of the trade routes through the Eastern South Atlantic. When Charles II declared war on the Dutch in 1672 a Dutch force took the island. The governor, who had escaped managed to warn a British Fleet of the situation and on 15 May 1673 the Island was once again in British hands. The island was home to Napoleon between 1815 and 1821. Napoleon was exhumed and moved to Paris in 1840. Queen Victoria presented Longtown House to the French and it is French territory. Until the 1850's the island was administered by the East India Company. The MV St. Helena anchored at Jamestown, St. Helena. The main centres of population are Jamestown (the capital), Half Tree Hollow, and Longwood. St. Helena's main income is from the export of fish. St. Helena coffee is of very high quality but the production is quite small. Tourism operates on only a very limited scale. Imports are high and the island has a large budget deficit; St. Helena receives a substantial annual grant-in-aid from the UK, most of which is budget aid although a significant portion is a shipping subsidy for the operation of the RMS St. Helena. Less than 1/3 of the island is suitable for farming or forestry. Principal crops are corn, potatoes, and green vegetables, and some sheep, goats, cattle, and pigs are raised. Flax was the major crop for some 60 years, most of it being used to make string for the Post Office. When, in 1962, the Royal Mail decided to stop using string, crop sales died and flax is no longer cultivated commercially. There are no minerals and virtually no industry, but some locally grown timber is used for construction purposes. Fish, mainly tuna, are caught in the waters around St. Helena, with being frozen at a cold-storage facility and the remainder dried and salted on the island. Almost all of the output is exported. Plantation House, home of the Governor. The island has no airport, being considered too mountainous, although a site has now been identified for a runway and discussion is taking place to see if the island should have an airport, although this would be extremely expensive to construct. The only port, Jamestown, has a good anchorage for ships, 1/2 mile off shore and cargo is landed by lighter, bring hoisted by two cranes on the quayside. As late as the 1970's fuel was delivered to the island in drums, but in 1981 a small tanker was acquired to deliver fuel and this is piped ashore. Today, the island has fuel delivered by a tanker 3 times a year. In 1975 the Union Castle Mail Steamship Company advised the government that they intended to withdraw the shipping service to St. Helena. The Government sought bids for a contract to maintain the service and in 1977 it was realised that there would be no service after September that year. The contract was awarded to the shipping company headed by Mr. Bell and the "St. Helena" began operating in 1978, the vessel operating until 1990 when it was replaced by a new, larger vessel, also named the "St. Helena". 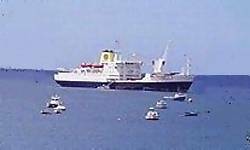 During the Falklands War, the "St. Helena" was requisitioned by the Government, its place being taken by a chartered vessel. This vessel, being bigger and better resulted in a strong desire to have a new ship for the service and the new "St. Helena" was built in Aberdeen by the former hall Russell yard, by then A. P. Appledore. The ship was to cost £19.4 million but finally cost some £32 million, the difference being met by the Government. 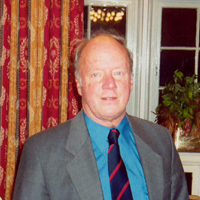 In 1999 the contract was due for renewal and company politics led to the resignation of Mr. Bell. It transpired that the company lost the contract to provide the service and within some 18 months the company had ceased to exist. Mr. Bell now has a new company that is active in marine consulting and other areas.